Lank Rigg is one of the lonelier of the western fells, sitting between the upper reaches of the Calder Valley and the remote valley of Worm Gill. The fell is one of the higher of the western fells, but is fairly rarely seen. From Ennerdale it is hidden behind Crag Fell and Grike. From the west the fells along the Cold Fell road block the view. It features in the views from Caw Fell and Seatallan, but those fells hide it from view from the east. It only really features in the views into the mountains from the south, and it can be seen from the A595 around Gosforth. Lank Rigg is a big grassy lump of a fell, but with a rugged remote character. The lower slopes can be rather wet, and the public right of way shown running alongside the Calder is ghastly. 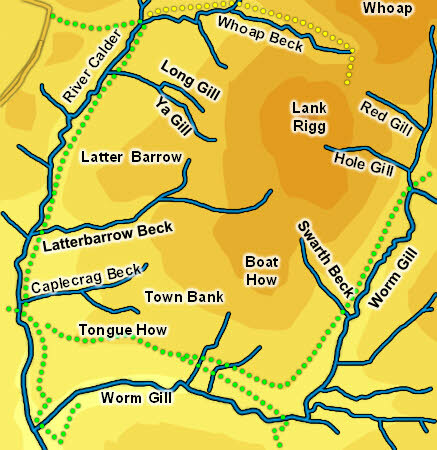 Lank Rigg is almost completely surrounded by the River Calder and its tributaries, running in deep valleys, so the only link to higher ground is the col that links Lank Rigg with Whoap to the north-east. In every other direction it stands alone. There is one good path onto the summit. This begins as a track that leaves the Cold Fell road south of Blakeley and drops down to the Calder. It then runs up the Calder before turning into a path at Whoap Beck. It runs up to the col, then turns south to reach the summit. Most of the other slopes are gentle enough for most walkers. There is one steeper area north of the summit (this can easily be avoided) and the south-eastern slopes are also slightly steeper. We have a circular walk on Lank Rigg that goes up the valley of Whoap Beck and returns view Latter Barrow on the western flank. Lank Rigg has a fairly flat grassy summit, with two very similar tops separated by the small summit tarn. The best valley views come from the edges of the large summit plateau. Lank Rigg is almost entirely surrounded by the River Calder and its tributaries. The only connection to high ground is in the north-west, where a col leads across to Whoap. At this point the sources of Red Gill and Whoap Beck are only 600 feet apart, and this is the gap in the line of streams and rivers. Whoap Beck flows west from the col but soon joins the Calder. The river flows west then turns south and runs around two sides of the fell. Red Gill flows east from the col. It joins Short Grain and the combined streams flow into Worm Gill. This sizable beck flows south between Lank Rigg and Caw Fell, then turns west to run between Lank Rigg and Swainson Knott, before flowing into the Calder just south of Monk's Bridge. Lank Rigg is a rather wet fell, and this is reflected in the number of sizable becks that run down the fell. On the western flanks are Caplecrag Beck, Latterbarrow Beck, Ya Gill and Long Gill. The eastern flank has Hole Gill, which is born very close to the summit, and Swarth Beck. Lank Rigg has a small tarn on the summit, but nothing much else. Lank Rigg has some remains of earlier life. Tongue How, its south-western corner, has the scatter ruins of early settlement. Nearby is Monks Bridge, an attractive pack-horse bridge that takes advantage of a rare craggy outcrop to cross the Calder. The bridge is no longer in use as a main route, but it was in use until surprisingly recently, and once had metal hand rails.